Apo E. Bazidi brought his prize-winning documentary to the 12th Annual Macon Film Festival this July and it is absolutely amazing. In 2014, following the ISIS attacks on the Kurdish people and city of Kobane, Bazidi went to the Syrian-Turkish border to volunteer with relief efforts. He encountered a cause and a people group hurting. He took his camera and used it to bring the story of Evlin and the Kurdish people to light. The film opens with Evlin, an 8-year old Kurdish girl, living in a refugee camp along the Syrian-Turkish border, explaining the events that brought her family to the camp. From the first shot, it is clear that Evlin is charismatic and wise beyond her years. Bazidi said that when he was filming at the refugee camp, Evlin approached him to tell the story of her homeland and displacement. Evlin speaks clearly, eloquently and with a smile that warms hearts. She explained how when her town got word that ISIS was coming, she and her family along with the other women and children, first, gathered very few belongings and fled to the border to seek refuge in Turkey. Evlin is honest about how the journey and current situation for her family aren’t easy. Evlin now lives with her parents, and two younger brothers in a tent, as opposed to the house they had in Kobane. It is clear the attacks have made the refugee children grow up faster, many have lost parents or siblings to the fight for justice. They have grown numb to the sounds of bombs and machine guns going off nearby. They still play and go to school. Evlin mentions early on that her education is of the utmost importance to her. The Kurdish people are resilient and they do not give up. While many fled Kobane dozens have stayed and given their lives fighting ISIS on the front lines. At the front of the resistance is a group of women, YPJ; these women range from teens to the elderly. They picked up weapons to protect their motherland. The women are standing strong, pushing forward and liberating areas. Bazidi does a great job of capturing the humanity and reality of the ref. Evlin’s story is poignant, timely and beautifully told. 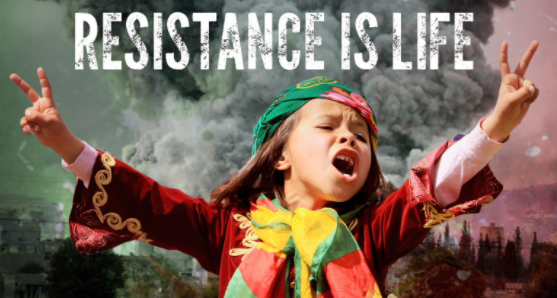 Resistance is Life is a 5-star film.